A cheap robot vacuum to you will be relative to what your budget is. 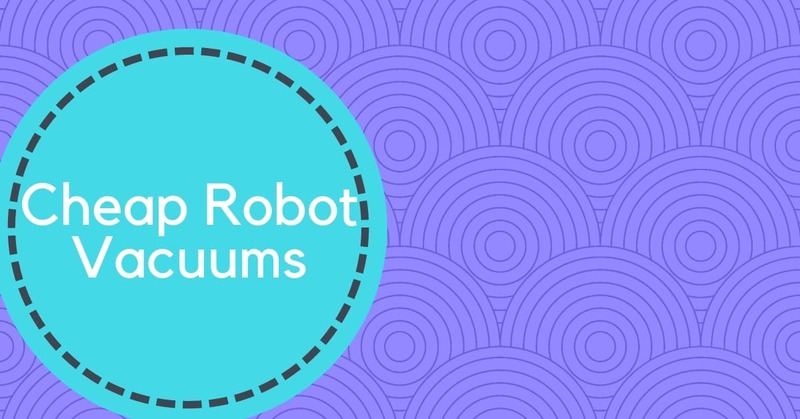 What we’re looking at here are the best budget robot vacuums under $200 and what kind of features that they offer for that price. When you’re looking at the top rated robot vacuums you are looking at prices up to $800 but they give you the latest features including room scanning so that you’re vacuum can clean efficiently and thoroughly covering the whole floor, being able to track it’s own progress and return to clean at the same spot if it needs recharging. Most cheaper robots can’t offer room mapping and tend to clean in a random manner around the floor. You do get some of these robot vacuums that have wifi and that can be controlled via your smartphone. These cheaper options do usually have a good running time, the suction isn’t always on a par with the more expensive options like the Roomba 980 so they do tend to be advertised as suitable for thin carpets or hardwood floors but they can be surprisingly effective at cleaning and not to be dismissed out of hand. One of the main features people want from their robot vacuums is to be able to schedule the cleaning so that you can set it and forget it mostly(apart from emptying the bin) and you will find that the cheaper vacs can still offer the ability to schedule cleaning. They have most of the basic skills that you want in a robot, they will return to recharge, they can manage not to bang into all of your furniture, they don’t fall down stairs and are usually slim enough to fit underneath the sofa. If basic is enough for you then check out some of our choices under $200 to see what you think.
. This is a vacuum cleaner and a mop but you can’t use them at the same time. There is a place for the dust bin and that is removed and replaced with a water tank to use the mopping function. is primarily designed for hardwood type floors, it doesn’t have a brush underneath but works with side brushes and suction to clean up. It comes with a dock and remote control and offers scheduling for cleaning if you are out. The water tank should not be used while the vacuum is on the charging dock as you don’t want to add water when plugged into electric. The battery can clean for around 120-140 minutes and has a max mode for extra power on dirtier areas. The vacuum has larger wheels to make it easier to get from one level to another and to help it get out of tight corners. This Ilife V5s pro is a budget robot vacuum that offers a double function making it very versatile. This vacuum can be scheduled to clean when you want and is controlled with a remote control or via the lcd screen on the top of the casing. The robot can run for 90 minutes before it returns to the dock for recharging. There is no brush underneath, the robot vacuum relies on the 2 side brushes and suction to extract the dust and debris from the floor. cleans with a random pattern changing direction when it encounters an object with the sensors on the bumper. The dust is collected in a dust bin which includes a HEPA filter which is helpful if you have an allergy. The Housemile robot vacuum is a circular vacuum with a bumper attached and it comes it at a very reasonable price of just under $100. This vacuum is more for hard floors as it doesn’t have a rotary brush for carpet cleaning, it uses the side brushes and the suction to clean the floor. doesn’t have a docking unit, the battery is removable and you plug it into the included charger when required. There is no remote control or app either, this vacuum has a button on the top of the vacuum to start it cleaning. There are 2 cleaning modes, small room and large room, the small room uses one press of the button and runs for 30 minutes and the large uses 2 presses and runs for 60 minutes. There is a small dustbin with removable filter under the cover. This is a basic but functional robot vacuum but if you need a scheduling option you will need to choose a different one. is a circular vacuum which a height profile of 3.1 inches and is black and red in color. The current price is just under $150 at the time of writing. doesn’t have a rotary brush underneath and relies on the 2 side brushes and the suction to remove all the dust and debris. It comes with a dock for recharging and will send itself back when the batteries go down. It has a running time of 90 minutes. The vacuum has a remote control which you can use to set the cleaning mode and the scheduled cleaning if you need it. There is a HEPA filter included in the dust bin to keep the dust out of the air and you can attach a dry wipe underneath to wipe the floor as it sweeps. This is quite a basic vacuum probably better on hard floors but it can do the job for a low price. is very reasonably priced at just over $150 at the time of writing. It’s a circular shaped vacuum which has a rotary brush underneath plus 2 spinning side brushes to get into awkward areas. comes with a docking unit and offers a running time of 60 minutes before it returns to be recharged. The vacuum comes with a remote control and you can use the different cleaning modes or set a daily time for the vacuum to clean. Although it says suitable for thin carpets it does have a turbo boost mode to help with a deeper clean. This design also gives a large dust bin so that you don’t have to empty it so often and it has a HEPA filter to help filter out allergens. This vacuum has had some good reviews and it worth checking out.